Once again, get additional savings on Disney titles by pre-ordering with Amazon! 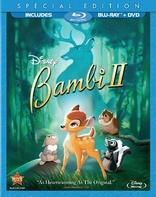 Amazon is currently offering an instant $8 off 'Prom' and 'Bambi II' with a coupon! And as usual, if the price drops further between now and the September 20 release date, Amazon's price guarantee will ensure the lowest price is passed on to the buyer! Click here to access the page where you can clip the coupons!